THANK YOU!!! The San Pedro Lions Club is part of the Lions-Belize National Children’s Eye Screening Program, taking on the challenge of screening over 105,000 registered school children throughout Belize. 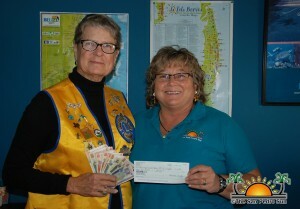 The San Pedro Lions Club is responsible for over 15,000 children in Ambergris Caye, Caye Caulker and all of the Corozal District. For those found to need glasses and cannot pay for them, our Zone 59 clubs are also paying for those glasses. Therefore, a special account has been set up to meet this need. The San Pedro Lions Club wants to say THANK YOU to Lion Bill Thornton, Lion Tamara Sniffin/The San Pedro Sun and the generosity of the Jerry Jeff Walker “Pickers” for contributions totaling over $1,700 recently! At the same time, we thank BCVI (Belize Council for the Vision Impaired) for providing free services and a pair of children’s glasses for only $60BZD. So far, San Pedro Lions Club has screened 638 children and will be in Caye Caulker in February for another 450 pre-school thru 14 year olds. Please attend our fundraiser on February 14th at Boca Del Rio Park and have a day of fun, food, music and raffles. We also thank the public for their contribution to the SERVICE the Lions are providing for our children.